For some reason, the Mission Rose has adopted a Dr. Seuss personality in my mind. 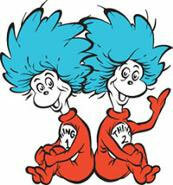 I find myself equating the two leaves with Thing 1 and Thing 2. There is something rather Dr. Suess-ish in their shape – if you took them alone, out of the project. Think of the hands or the hair of a Dr. Seuss character, and you’ll see what I mean! 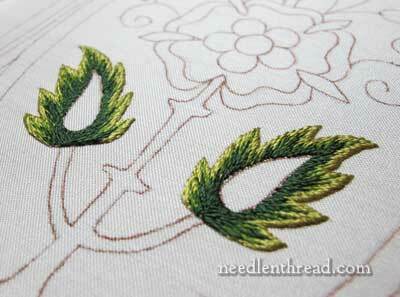 The second leaf on the Mission Rose is embroidered in exactly the same manner as the first leaf was embroidered. …and finally, the darkest green. And I wasn’t as pleased with the outcome of this leaf. I will take it out and re-stitch it. I’ll tell you what happened here. 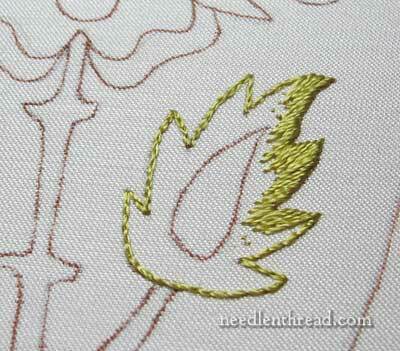 This whole leaf – being the size it is – doesn’t take that long to stitch – maybe 20 – 30 minutes. But in that time, I had three interruptions, including a phone call which took me away from it for quite a while. So on this leaf, the rhythm of stitching just wasn’t there – I’d get into it, and get pulled away, then get into it, and get pulled away. On some types of embroidery, interruptions don’t matter, but for me, on this type of embroidery, I need time to concentrate, to get a good stitching rhythm going, and to work towards a smooth, coherent image. I never do well with long and short stitch when I’m starting and stopping and starting and stopping. In any case, I’m not pleased with the lack of smooth transition on the whole right side of the leaf. The lower left side of the leaf looks pk, but the whole right side and the top left are both bothersome. So, it is inevitable – out it comes! Next time we visit the Mission Rose, we’ll talk about the clean up job on this leaf, and (hopefully!) you’ll see an improved leaf. 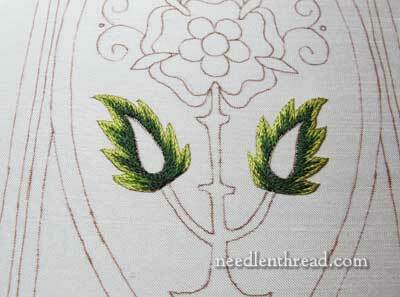 We’ll also glance at some of the smaller leaves in the design. But before we get into that, there are a few topics in the queue, awaiting the light of day – including a progress report on another project. Left-hand leaf is super. Maybe it would help to trace the space in the LH leaf, flip it and make the RH leaf’s space exactly that same shape, even though the outsides are not quite identical. The two insides shapes are close enough together that a difference will look wrong. That’s just my opinion, of course. I don’t like interruptions too, especially when I am busy with gluing furniture pieces. The worst though is when I am nicely settled under the lamp busy with my petit point when the phone rings, it just takes so long to put everything down, on occasion if I remember I take the phone off the hook, I figure if it is important they will phone again. I think thing 1 & thing 2 are lovely,but I know when I see something that’s not quite right when I’m stitching it irks me and I keep looking at the one element that isn’t quite right instead of concentrating on the whole project, so often I have to unstitch even though other people may not notice the difference I do. Happy unstitching!!! Here are some leaves with shading on view. They are paired, not reversed and Two’s not quite controlled. Leaves must be subdued before couching the gold. Very clever, Jane! 🙂 Thanks for the smile! LOL. I probably wouldn’t have noticed unless you pointed it out, but I can see what you mean. Subtle, but something’s a bit off. It is tempting not to answer the phone, but… I was hoping for a call from my son, but he sent a reply to an email saying he tried to call but we didn’t answer. (He wanted us to watch something being streamed live over the internet, which we, of course, missed.) Sometimes it’s hard to know whether to take those calls, or ignore them. (Of course, a voicemail would have been nice, DS…) Often I find it peaceful to work late at night because I know we won’t be getting any calls, and nothing except sleep is pulling me away from a creative endeavor. Thing 1 and Thing 2 eh. Well, as long as they stay on this post posing as leaves and don’t come thinging around my personal space! The stitching rhythm is interesting. I’m easily distracted so must pay attention to that. My booklets came today. Thing 1 and Thing 2. I mean booklet 1 and booklet 2. See what those Things are doing, getting in on me already! Anyway, am so very happy with my winnings, they’re very special and I feel very special receiving them. Thank you both. I want to follow along on this project – but can’t fit the silk threads into my budget at this time. How close would DMC floss work? Or should I wait until I can swing for the sild threads? Thank you very much for sharing with us the right-hand leaf. 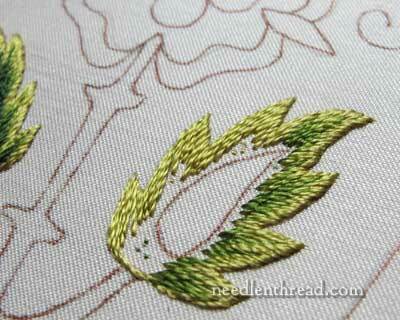 It really shows us the importance of what you call “the rhythm of stitching”. No more stitchin in the kitchen this winter – I’m off to fine a cosy little nook. Hi Mary. Thing 1 and Thing 2 equate to Frick and Frack over here. They are ever present. Stitching requires my full attention. There is no ability to divide or alternate attention when stitching for me. Plus I can’t stitch when I am tired. This is why I stitch at a snail pace! I’ve learned that it takes longer to stitch if there is no ability to sustain attention to only stitching, especially in the shading/long and short stitch. Glad to hear your words of wisdom echo in my thoughts! Looking forward to Leaf 2. Next Next post: Hungarian Redwork Runner – Halfway! and Beyond!